In and around Cusco I’ve spent heaps of time. 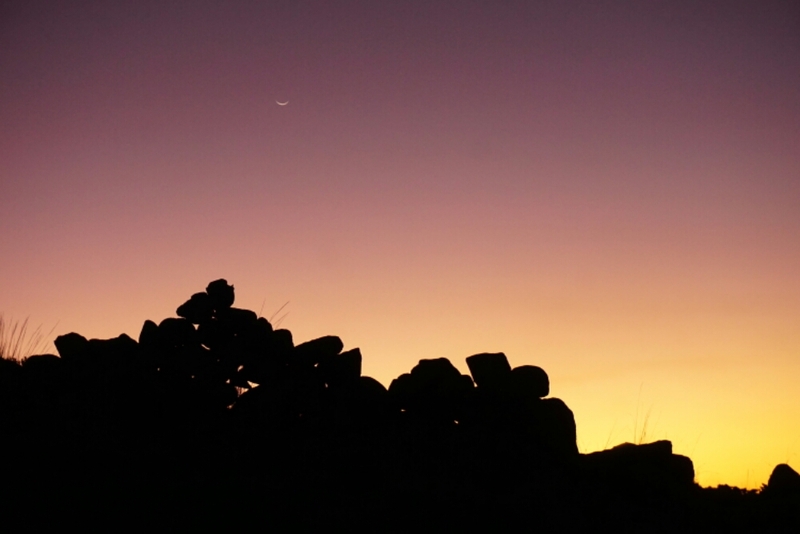 The time in the town itself, Machu Picchu, Choquequirao and the development project in Quiquijana hold beautiful experiences. 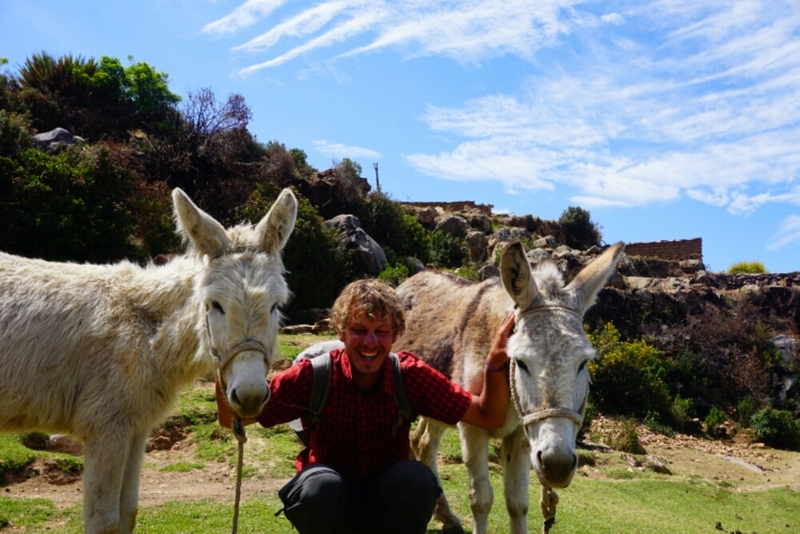 After the trek with Vincent and Camille, we went back to Cusco, where I met Sam for the first time. He wrote me several weeks before and revealed that he will cycle from Lima down south and that his way might cross mine. In the meantime we are traveling together since some days. But as well as Vincent and Camille, he still wanted to visit Machu Picchu and so I initially went on with my travel by my own! And at first I had to go back to Quiquijana, where I left my bike and some of my stuff. A last time in the Albergue Uñacha to say goodbye to the volunteers and the nuns. 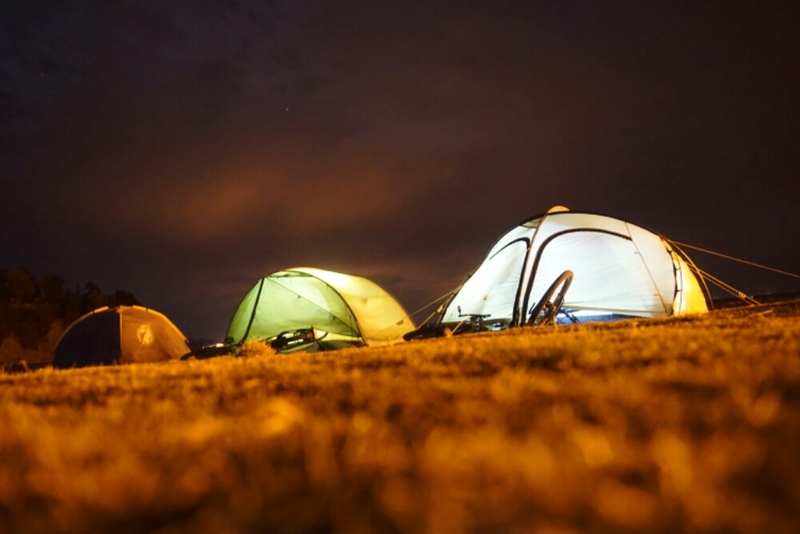 Due to the advanced day, I decided to stay another night in the accommodation of the volunteers. 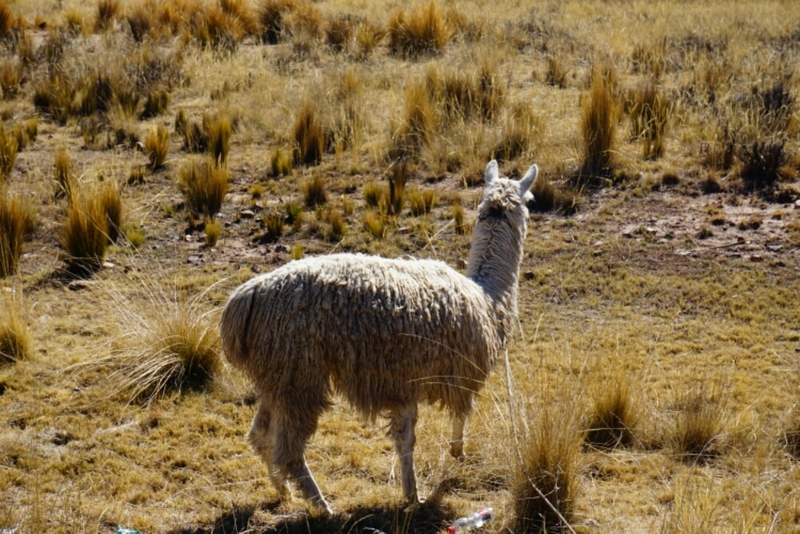 The next day I was cycling uo next to the river towards the altiplano. The first night I was quite exhausted and the altitude made me feel tired. Only a few kilometers before the pass La Raya I needed to take a rest and finally set up my camp in a garden of some locals. The nights became colder due to the altitude of around 4000 meters but till now my equipment always provided me a warm and comfortable night. 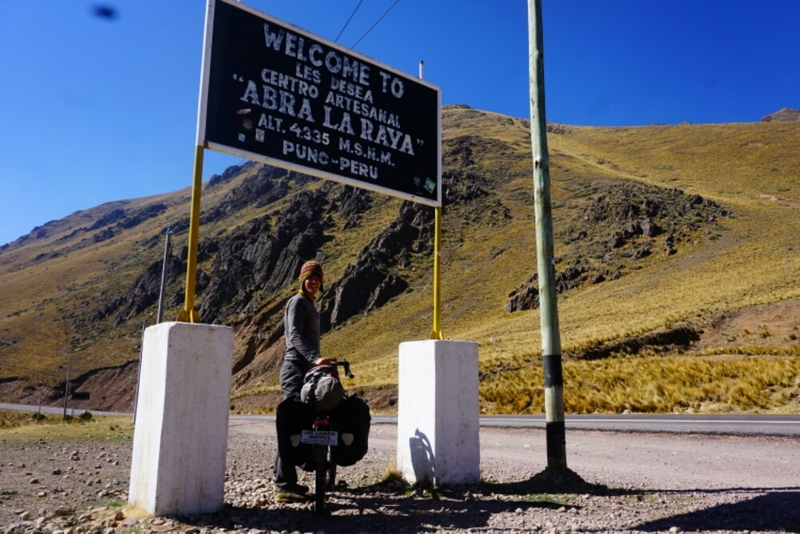 The highest point of my travel on my bike I reached in the morning, Abra La Raya with 4335 meters above the sea level. 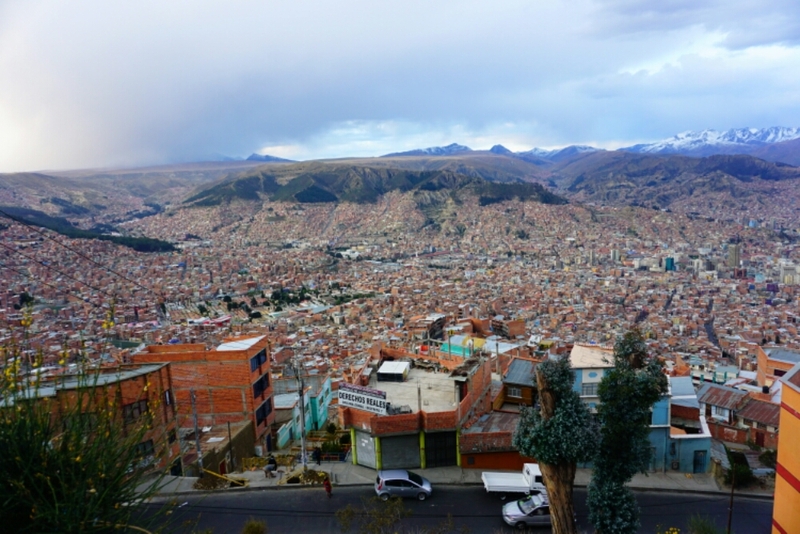 I’ve reached the altiplano and after some meters of descent the street was more or less plane. In Pukara I was allowed to stay in the garden of the police. When I was about to push my bike into the shade I didn’t recognize a little house with 7 little puppies inside and before I realized was was happening I felt the mouth of the mother dog around my ankle. The first time in my life I was bitten by a dog. Fortunately the dog didn’t bite that strong, so that only a small mark could be seen and I had no further pain, but I was a bit suprised by that incident. 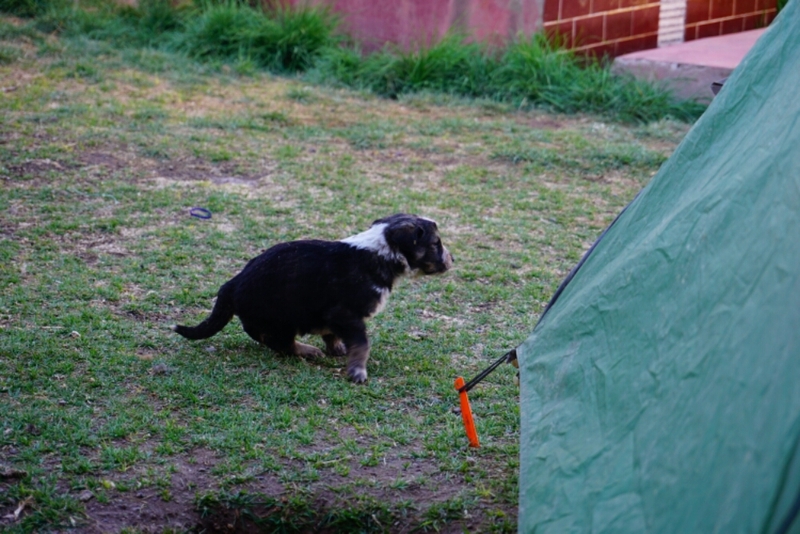 But not enough – during I my discover of the village and their ruins, the dog attacked my tent and left behind a hole in my outer tent, luckily on a spot where is not that fatal. 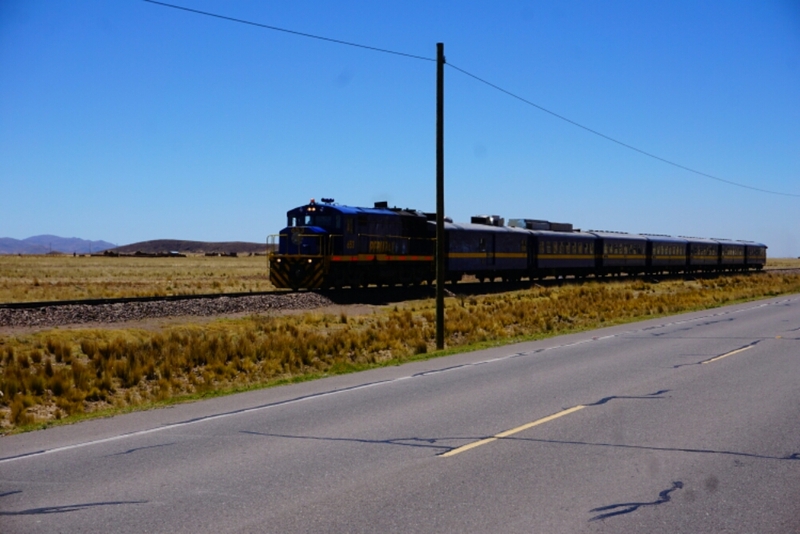 On my way to Juliaca, the biggest city of the province Puno, I saw several Alpacas and Llamas as well as the Peruvian Train who connects Puno to Cusco. Juliaca itself was the next stop and another nest of chaotic traffic. Geovanni, a warmshower, who is having a Casa de Ciclistas hosted me and offered me a good place to save my picture in my cloud and to change my oil of my Rohloff, which needed to be changed after more than 5000 kilometers of riding. With a instruction video in the Internet it was not a big thing. In the evening I cooked with Geovanni while having a good conversation. A nice person, who is doing woodwork in his house and already hosted over 1000 cyclists in his house. 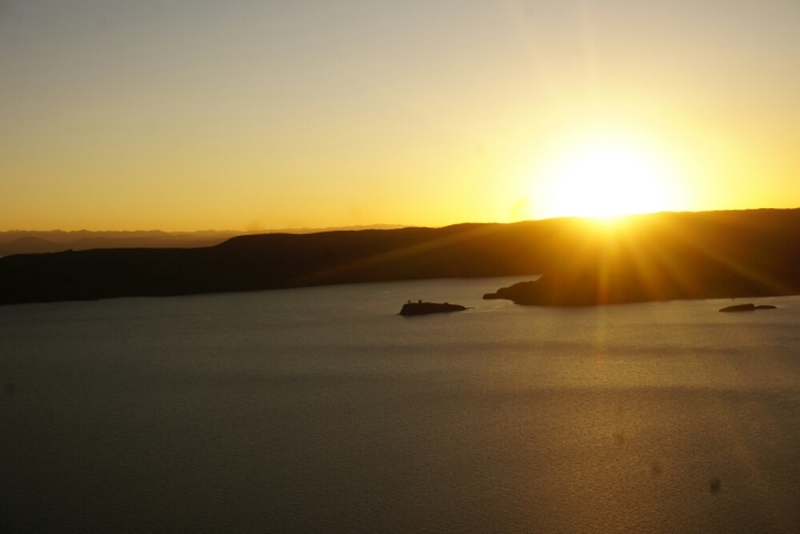 From Juliaca it was just 40 kilometers to arrive Puno, next to the lake Titikaka. The town is not that beautiful, but it does have a nice vegan/vegetarian restaurant called the Loving Hut. 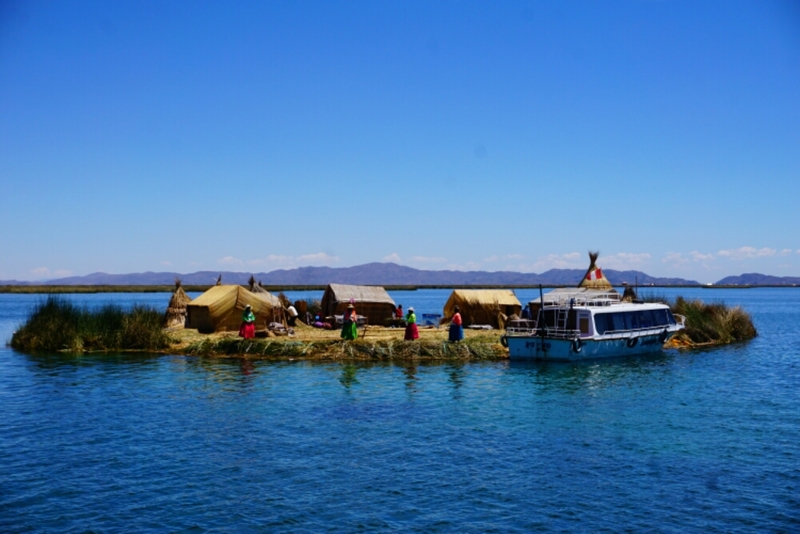 The floating island as well as the steady islands Amantani and Taquile were worth a tour from Puno and so I was in the harbour very early to catch one of the boats. 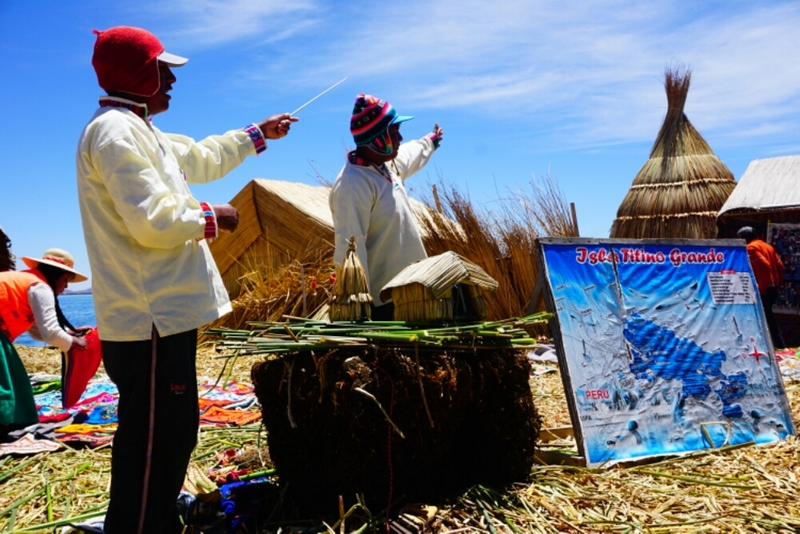 The floating islands of he uros are very touristic but the history behind it is great and the construction of the islands as well. And so we stopped on one of island where president Ernesto explained us how the island is constructed. 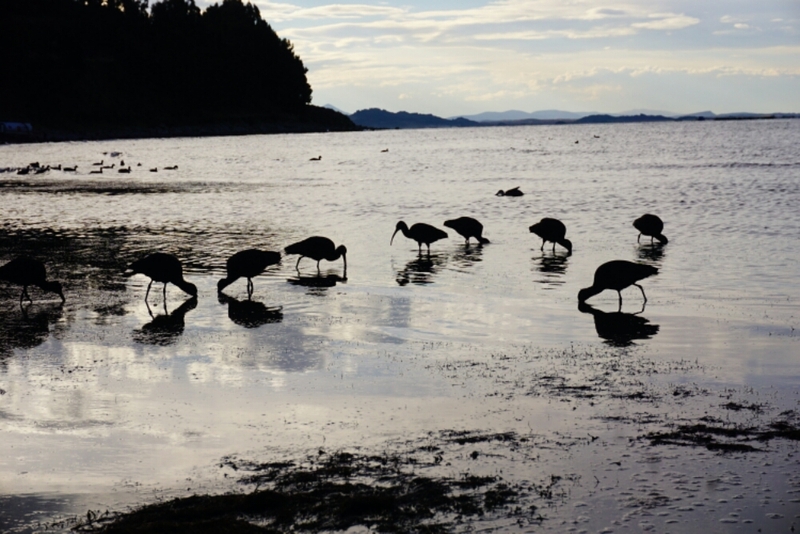 The tortora reed, which grows in huge amounts in the lake, is the basic element for the buildings, their traditional boats and the ground of the island. 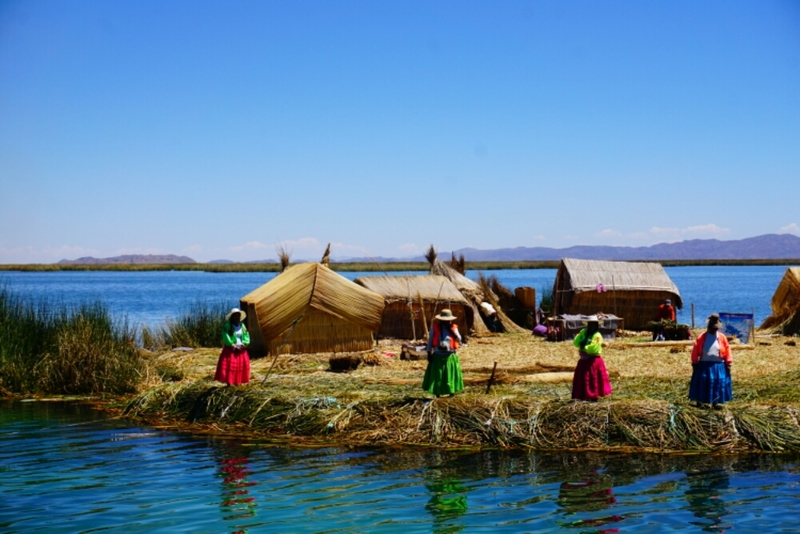 In the time of the incas the uros people used their islands as a refuge in case of attacks, nowadays just around 70 islands are left. On the boat I got to know two girls from America and one from England, with whom I was staying in a house of a local family on the island Amantani. 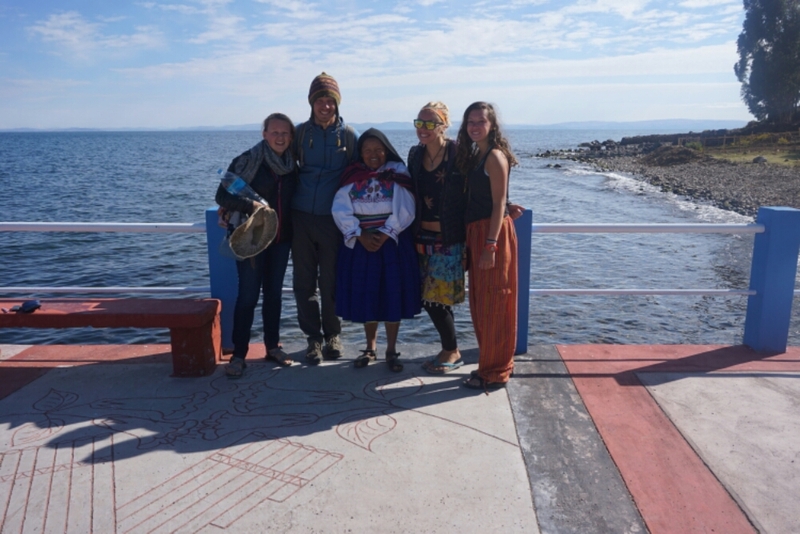 After lunch we went up to the highest point of the Island, where the temple Pachamama was placed. Besides the nice view over the lake I got to see the most beautiful sunset of my life. 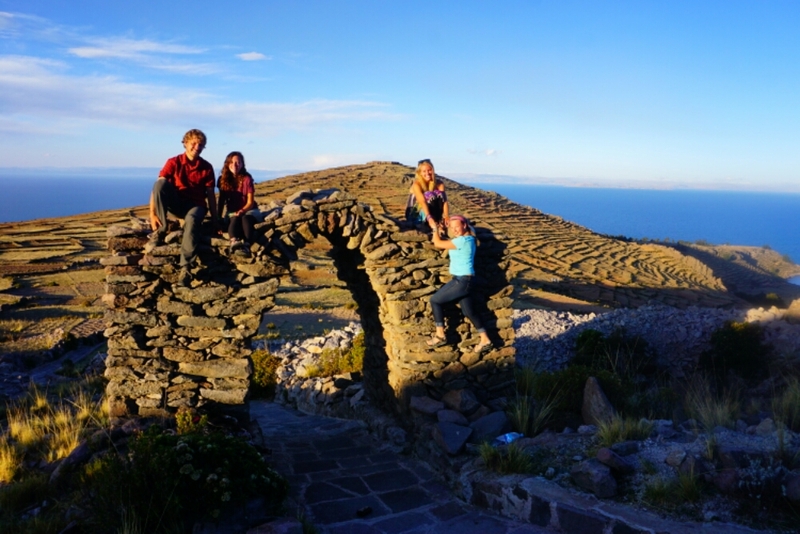 The day I came back from the islands Sam and Camille arrived in Puno, but they were about to see the islands as well and so I was again goin on on my own. In Juli, a small village next to the lake, I found a perfect spot to camp directly next to the water. Sam, who missed the departure of the boats in the morning, decided to hitchhike to Juli too, so that we both camped next to the lake. 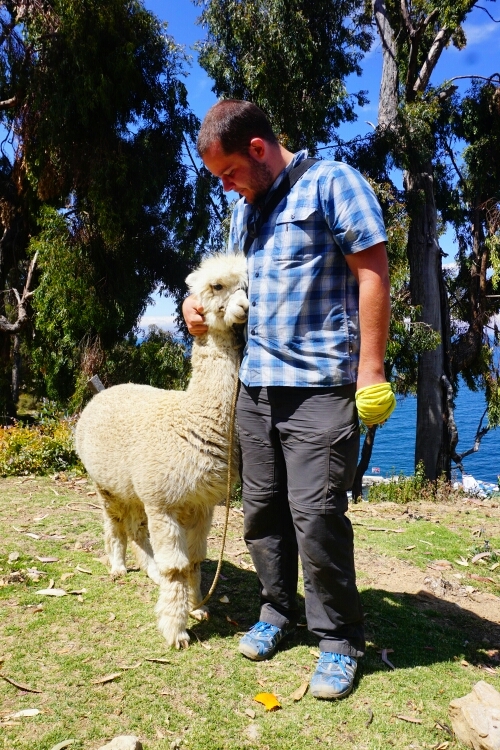 But not enough – a guy from Uruguay showed up, traveling by walk and is already 4 years in the road. He was only having a backpack with his tent and some arts he sells in he road – crazy and amazing person. So he stayed as well next to us, so that it felt a bit like a camping spot. A hundred meter from our tent accumulation a french couple stayed in their van and invited us for breakfast. 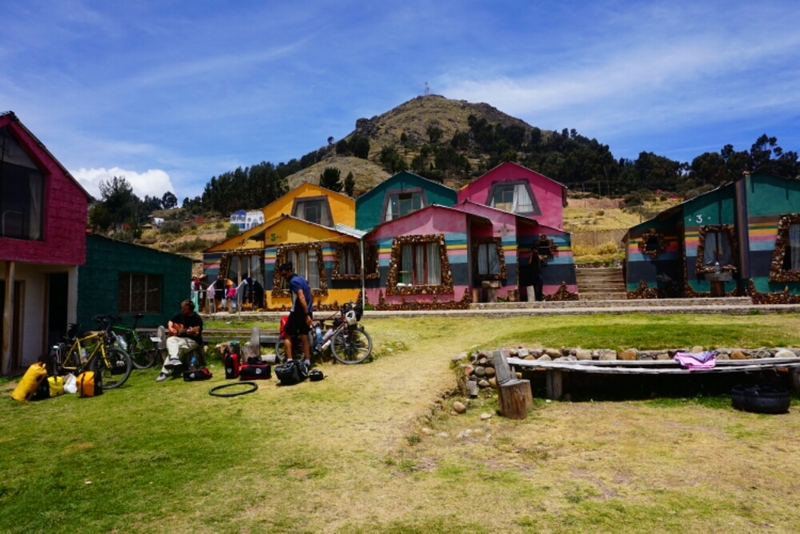 The next day I started my first cycling day with Sam and my last day in Peru. 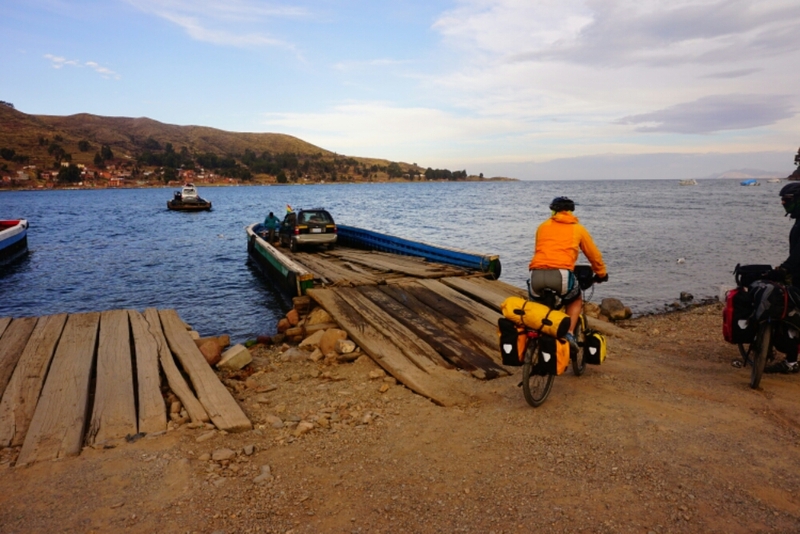 This day we were about to cross the border to Bolivia to reach Copacabana. 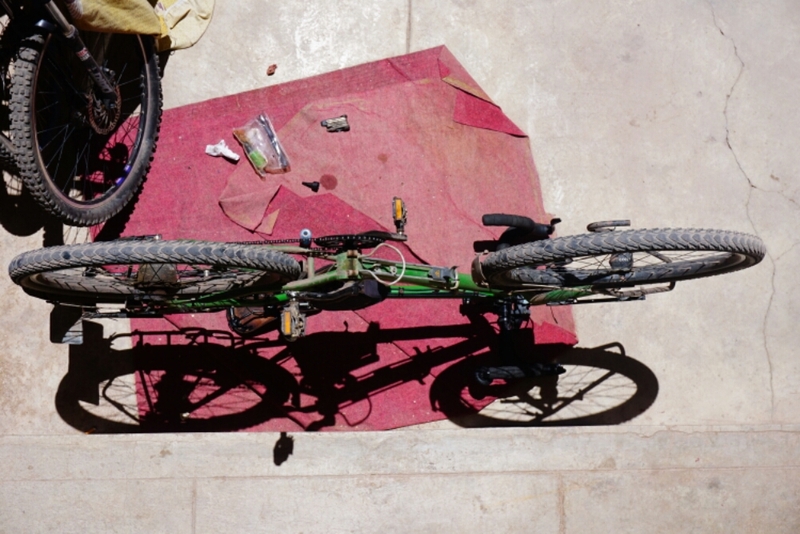 And in contrast to Equador, where I had two flat tyres in the last two days, my tyres had not one flat tyre in Peru, so two months without the need to patch my bicycle tube. Most of the time we were riding next to the lake with a beautiful view. 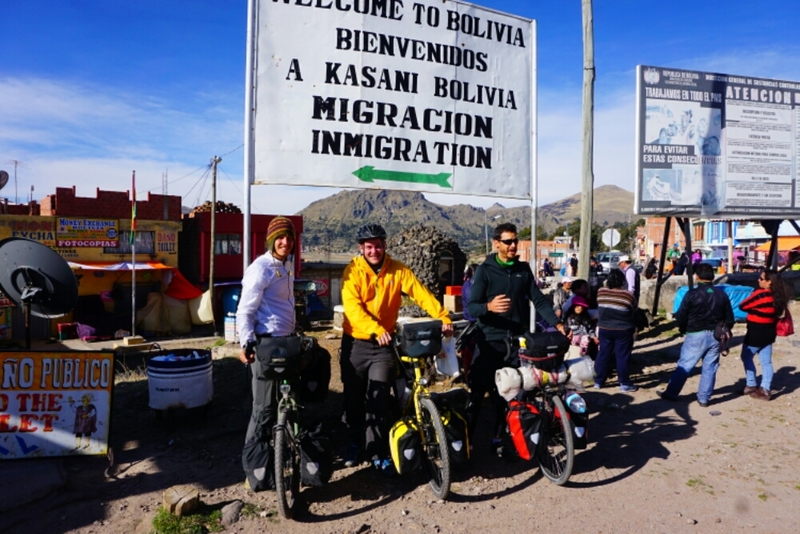 In the middle of the day we met Chase, an Australien police officer, and Shima, a 65-years-old Japanese, whit whom we were cycling until La Paz. The border-crossing was again no problem, like it had been on all borders so far. 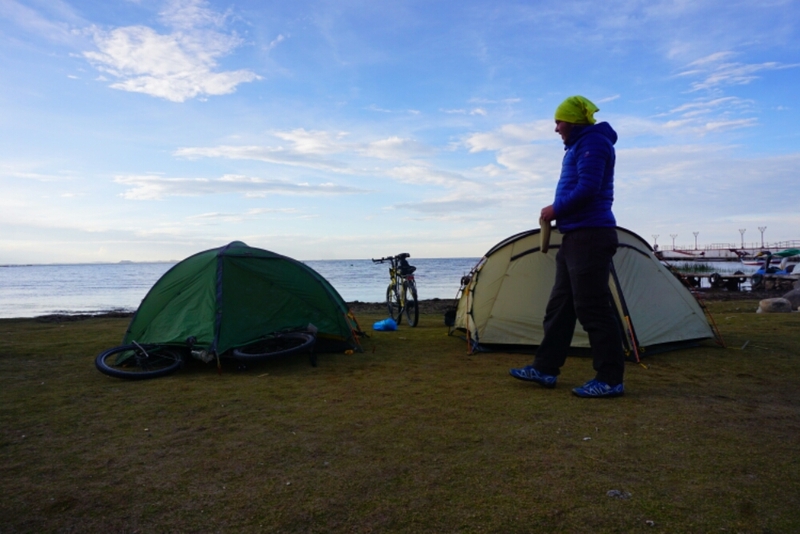 Arrived in Copacabana we found a nice campsite, where they also offered beds, which were just some cents more expensive than the price for a tent, so that we weren’t that motivated to set up the tents. 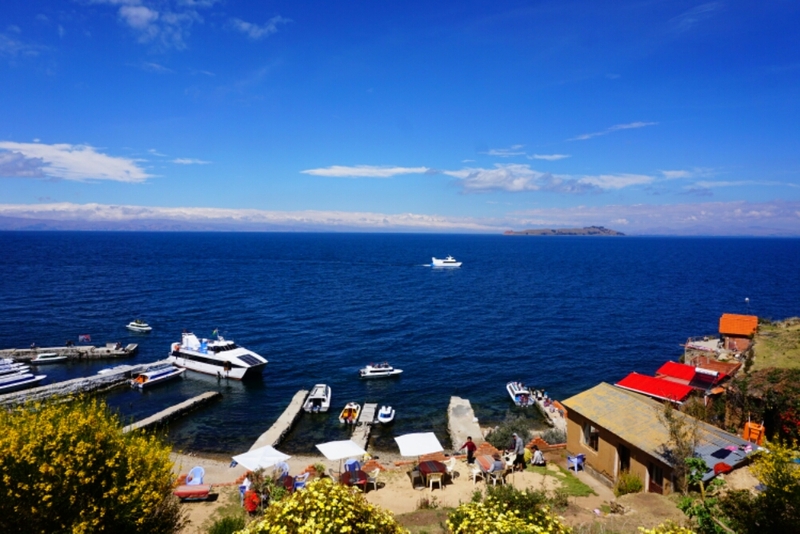 A nice concert in bar of a german and an australian musician and a trip to the Isla del sol were the highlights in and around Copacabana. 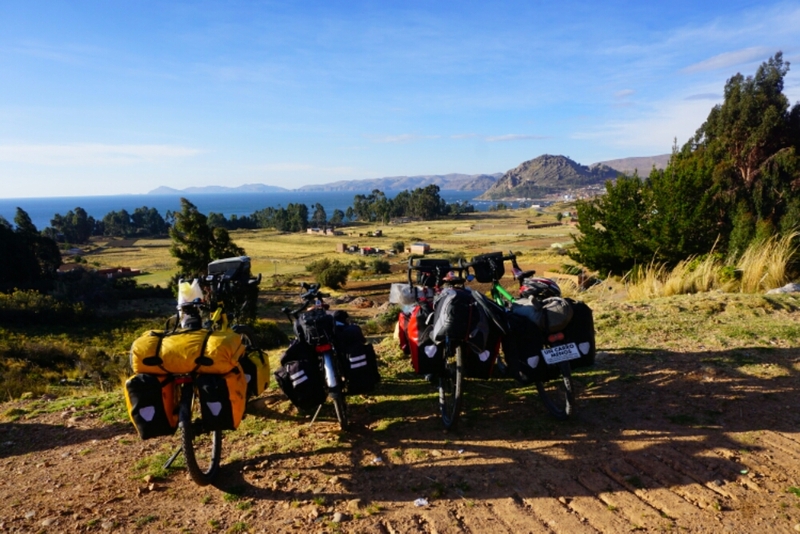 As a multicolored bycicle group we left Copacabana through the mountains to the ferry over the lake Titikaka. The ferries were quite old, around 40 years old the captain was guessing and so it was like a little adventure to cross the water on that wobbly construction out of wood. 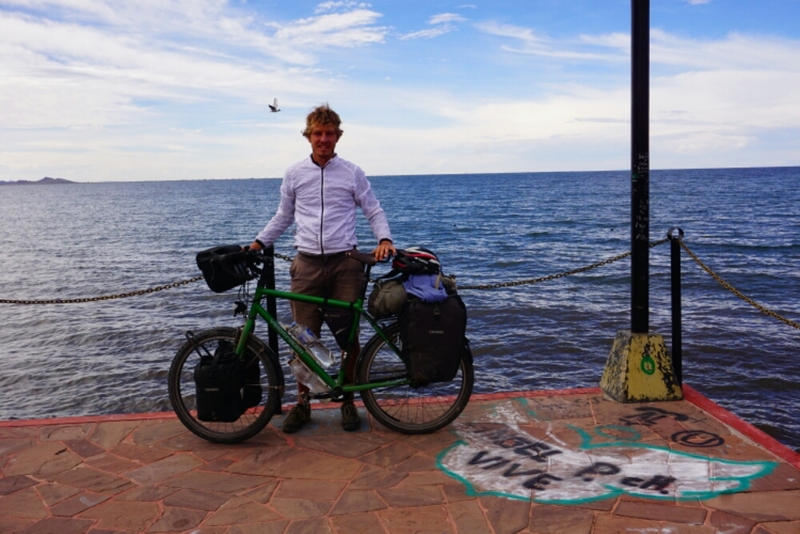 Savely arrived on the other side in San Pedro de Tiquina, we met David, another cyclist from Australia. 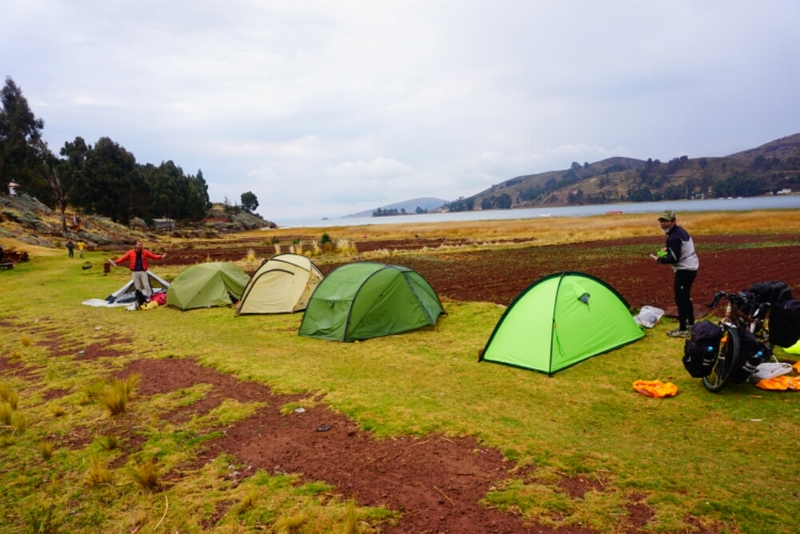 Due to the advanced time we decided to find a place to camp and set up our five tents next to each other on the rim of the lake. 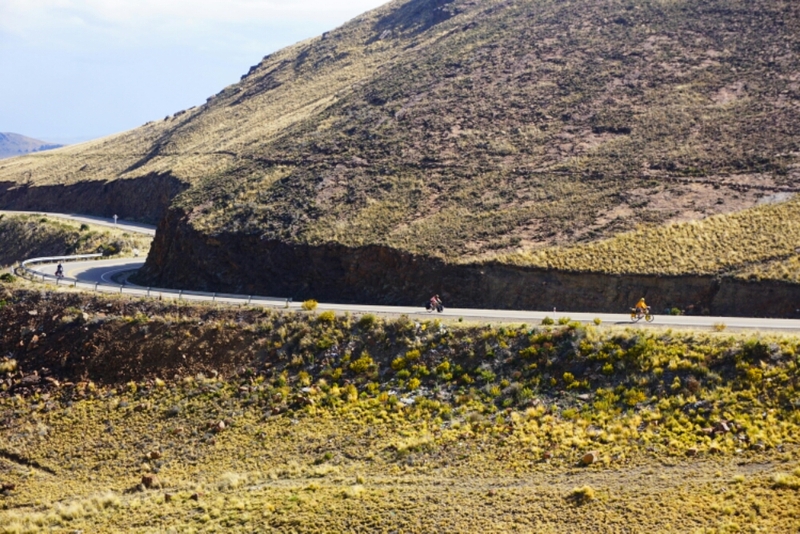 113 kilometers were left to La Paz and for Shima it was the longest distance ever, so that we started early in our last cycling together. Suddenly Sam warned me that something is wrong with my Ortlieb bag at the back and as I had a look I realized that one screw was missing and my bag was hanging down a bit. I first fixed it with a rope but later that day on a bad road inside a roadwork the bag was about to fall again. A second screw came off and got lost and so I had to fix the bag again, this time with a cable fixer, but on the last meters downhill into La Paz the plastic of the cable fixer got broken, so that I decided to put my bag pack on my back and the Ortlieb side bag into the middle of my rack for the rest of the day. 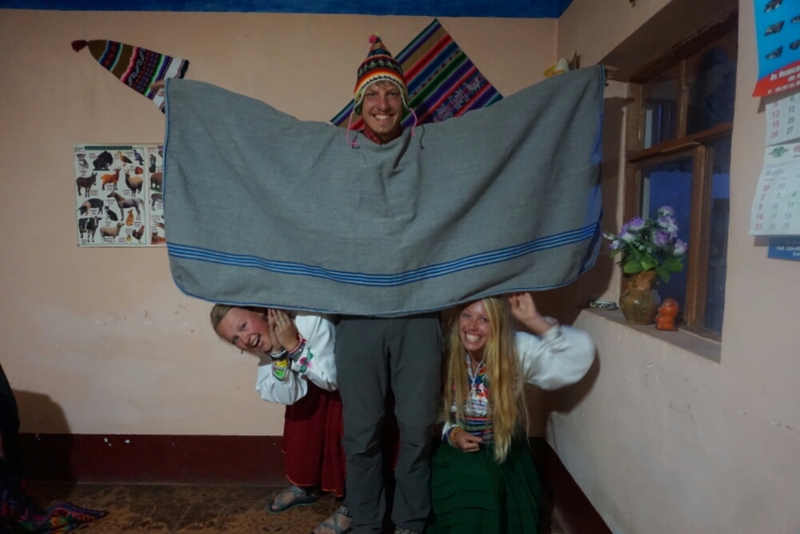 Here in La Paz, we stay in another Casa de ciclistas, where Christian, a half german welcomed us. Here we will spent some more days, time to find new screws to repair the bag, to discover the city and to talk to all the other cyclists from all around the world, who are staying as well in the Casa de Ciclistas. But as another highlight of my trip, Sam and me decided to climb Huayna Potosí, a 6088m high mountain, 30 kilometers from La Paz.